Current Research Information Systems (CRISs) and Institutional Repositories (IRs) are two main components of the Research Information Management realm. The rising strategic importance of CRISs and IRs for higher education and research institutions is linked to the need of fostering research and innovation. The features of these two systems have gradually been extended and their role within the institutions is permanently evolving as an answer to new policies on Open Access, National Assessment and Research Funding. As a result of this evolution, we often see now CRISs acting as repositories, CRIS-like repositories with extended data models, a wide range of interoperability features between co-existing CRISs and repositories and even a new species in the ecosystem that claims to be both a repository and a CRIS. Within the framework of a Partnership Agreement signed in 2014, EUNIS, the European University Information Systems Organization (www.eunis.org), and euroCRIS, the European Organization for International Research Information (www.eurocris.org) launched a joint survey aiming to collect as much data as possible on the information systems currently in use in Europe to support the Research Area. 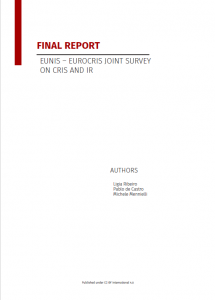 The scope of this joint EUNIS and euroCRIS CRIS/IR survey, was to collect information on CRIS and IR technical solutions that support Research and to analyse their relations with other systems used within Higher Education Institutions: how they interoperate, which data and metadata are available and how they are used. The CRIS/IR survey, which was launched in April 2015, was based on a previous initiative to collect information on the CRIS and IR infrastructure available in Portugal. The survey was distributed by EUNIS and euroCRIS via a number of national and international mailing lists and was open until mid-September 2015. There was wide participation from the community, and we collected 84 full responses from 20 different countries. The two main questions the Survey tried to answer were: are CRISs gradually replacing IRs? Are the two systems overlapping in their functionalities? From the results we have collected, both questions seem to get a negative answer. The two systems are clearly complementary: while IRs are the preferred choice for managing research publications and dissertations and thesis, CRISs are regularly chosen for managing the institutional research information as a whole including metadata for research papers. Johan Bergström is currently the manager of Eunis Research and Analysis Initiative (ERAI). Is the working as an International Business developer for ICT Services and System Development (ITS) – Umeå University. Lígia Ribeiro has been Principal Researcher at the Faculty of Engineering of the University of Porto since 2002. She was pro-rector at the University of Porto between 2006 and 2014, being responsible for ICT. Between 2004 and 2006, she was President of EUNIS, after being Vice-President for two years. She is presently a member of the EUNIS Board of Directors. Michele Mennielli is responsible for International Relations and Business Development at Cineca, the Italian Consortium of University. He cooperates with different international organizations to create cross-national collaborations and projects. He is Board Member and Secretary of EUNIS; Member of the DSpace Steering Group and Board Member Executive for External Relations of euroCRIS.